Cebu Is a Beauty | A Cebuana Lifestyle Blog: #GlobeUnleashed in Cebu - Get FREE Tickets! #GlobeUnleashed in Cebu - Get FREE Tickets! Globe throws the best parties - hands down. You wouldn't want to miss a party like no other! 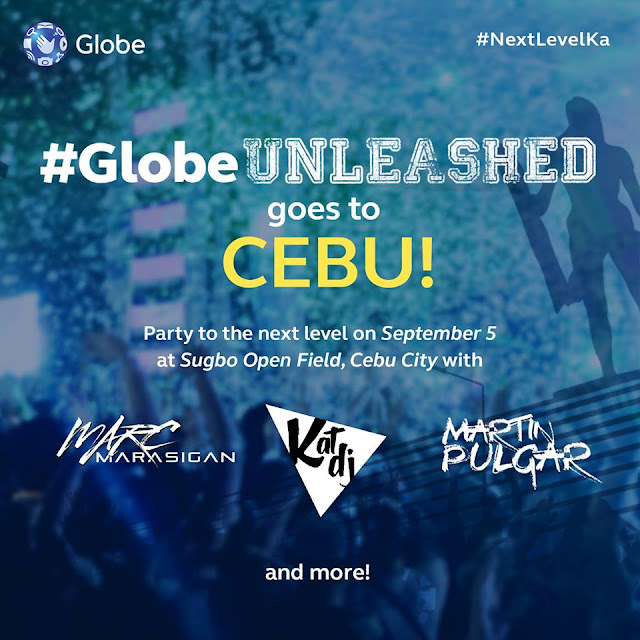 Get free tickets to #GlobeUnleashed Cebu party. Be there and relieve yourself of that midterm exam paranoia. Drop by the Globe shop in Ayala Center Cebu. Buy a Globe sim. Load up. Register to GoSurf. Buy tickets at the door err entrance for P300 and walk right in! Come in your best party-party mood and see you all at the SRP grounds on Saturday, Sept. 5, 2015!